Tagged under Kairi Shimotsuki, Studio Sakimakura, Series. The story reimagines the legendary adventures of the 10 brave warriors assembled by the warlord Yukimura Sanada. in the year 1600, in the middle of Japan's tumultuous Sengoku (Warring States) era. 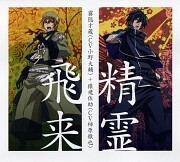 The series begins when Isanami runs from Izumu Shrine after it got wiped out by assassins. As she runs from them she gets saved by Saizou Kirigakure and later on they meet the warlord Yukimura Sanada who recruit them for a war against this unknown enemy. 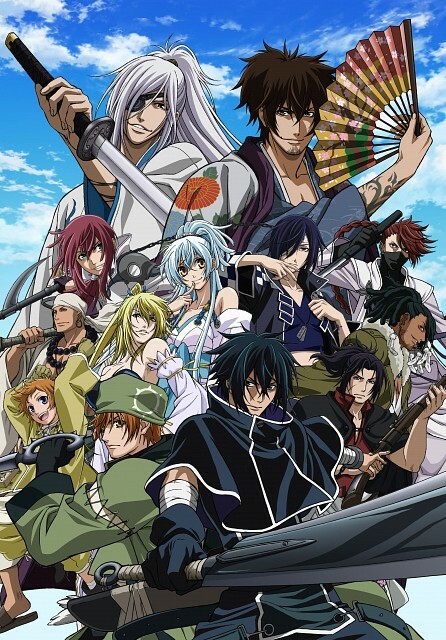 the only thing i like about this anime is the storyline, but the ending was dissappointed because i thought it would have more action and i didn't like how they make Ana a traitor, however, the graphics are great and the characters are well drawn, so still. it's a good action anime. Started to watch cause I'm interested in Sengoku era a lot^_^ we have characters like Sanada Yukimura, Date Masamune, Sarutobi Sasuke etc. here, so I'm in^_^ First, there is a lot of action here, one will not be bored for a moment watching it. Fighting scenes are well done, bloody too. Despite that the fights get violent,this show has funny moments and totally messed up, crazy wierdos. Bishies too. I like the characters, they are original and have strong personalities (and awesome seiyuus). I even can stand Isanami with her behavior (she fancy Saizou so much thats it kind of.. rude), was kind of shocked with it but eventually I found it pretty funny^_^ well, anyway its explained later in the show why she was raised like this, isn't it? Ah, yes, and Saizo reminds me of Noctis from the forever unrelased game FF Versus XIII. They look kind of alike, the hair, clothes... ne? it's a samurai anime and an action anime that's why i like it and i saw it in first place, i like the main characters, but i thought the anime will have more action and fighting scence like Bleach but sadly the ending was short so Bleach still on the top of the Best Action Anime. still i enjoy watching it . I wasted two days of my life. Some parts are interesting ('the girl is the darkness and the guy is the light', sounds kinda cool) but all together is terrible. Saizou is a complete coldfish macho and Isanami is another useless pretty chick with inferiority and abandonment issues, no more. 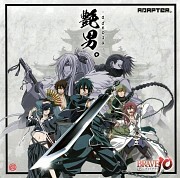 I found this series because Saizou interested me, He seems like an awesome main character! Though probably like everyone else, Isanami annoys me. She is too clingy to Saizou and whines way too much! but I have watched the first 2 episodes and I came to really like Anastasia and I generally speaking don't like women. But I am reading the manga as well, which of course I would recommend first, it has much more detail in it. The drawing and the action are also very good in my opinion! 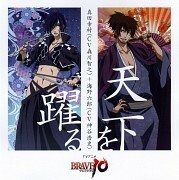 No feedback on Brave 10.